It wouldn't be Sundance without one, two, three, sometimes more films from Mark Duplass. This year the multi-talented filmmaker arrives with Paddleton, which he co-wrote and will star in alongside Ray Romano. Unlike many of Duplass' prior projects to hit Park City, this one already has a home as Netflix plans to release it just a few weeks later. In the film's new trailer, we learn the title comes from a paddle game played by Duplass and Romano's characters. It'll be an escape for the two of them as one learns he has a terminal illness, and seeks his friend's help in committing suicide. A surprisingly light-hearted trailer for such a bleak subject, but that's to be expected when you've got Romano as part of the comedy equation. Illness has never been funnier than in The Big Sick and Romano was a big reason why. 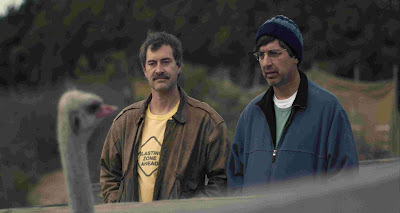 Paddleton is directed and co-written by Alex Lehmann (Blue Jay) and will hit Netflix on February 22nd.